This is how a healthy heart works. Oxygen deficient blood arrives in the right atrium, flows through to the chamber and is pumped out into the lung artery to the lungs, to be oxygenated. The oxygen rich blood then goes from the lungs to the left atrium of the heart to be pumped out into the body. This is what Abbes heart condition looks like. The lung artery is blocked (pulmonalis atresi) so the oxygen deficient blood cannot get to the lungs to be oxygenated. Instead, the blood leaks out through a hole between the chambers (VSD) and out into the body. This is all theory. In real life you cannot live like this. 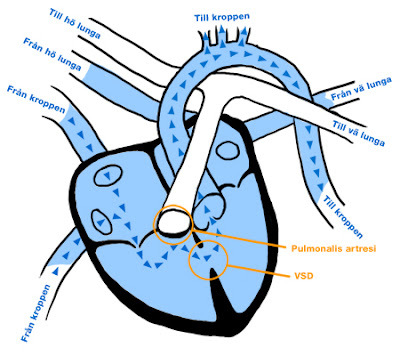 After his surgery, the oxygen deficient blood from Abbe’s body will leak from the left heart chamber to the right through the opening (VSD). There it will be mixed with the oxygenated blood from his lungs and pumped out into the aorta. 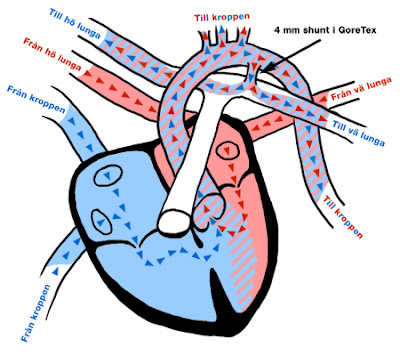 A small GoreTex tube (shunt) will connect the aorta with the left lung artery, so that some of the blood will flow that way and into the lungs to be oxygenated. The rest of the blood goes on out into the body. That blood will be a mix between oxygen rich and oxygen deficient. They estimate that Abbe’s blood will be oxygenated to about 80%.